Some Kidding Aside – Are You Trying to Go Out of Business? It really isn’t what you say, but how you say it, isn’t it? Your privilege to mail at presorted prices will expire on the dates shown below. If you plan to continue using your existing privileges, the fees noted below must be paid prior to the indicated due date. My privilege? Let me get this straight. The Post Office is doing me a big favor by taking thousands of my dollars every year, giving me a slight discount because I’m doing a lot of business with them. If I want the pleasure of them continuing to take my money, then I need to hurry up and pay them some more money. Do I have that about right? I want to thank you that I have a job. Without your continued patronage, I and thousands of other people like me would be out on the street. I also want to thank you for being a bulk mail customer and I hope that you will do us the honor of renewing your contract with us for another year. Don’t get me wrong, I have known scores of mail carriers over the years that do their job with grace and professionalism. Unfortunately, it would appear that they aren’t the ones making policy and writing the letters. Attached you’ll find a new sales agreement. The new sales agreement is required. You were paying $140 and now the cost is $176 per month. Please sign and return the sales agreement. I’m required? Does this sound like a company trying to stay in business? Let me drop a little hint here. 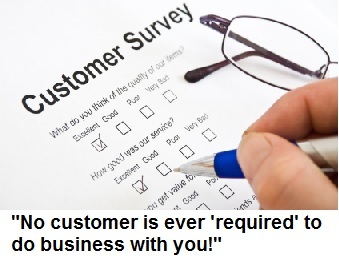 No customer is ever “required” to do business with you! Even if the business is the only game in town (a utility, for example) the customer still has the option of kicking their sorry rear ends out of there and replacing them with someone who actually cares about the customer. So, guess what I did when I received this e-mail requiring that I sign a new contract at a higher rate? I went shopping for another Web hosting company because I don’t like being ordered to sign a contract paying more money for mediocre service. I’m just funny that way, I guess. So what’s the take away here? Do yourself a favor and place yourself in your customer’s shoes for a moment. Why not treat them with the respect and appreciation you like to receive? It’s a big deal when someone chooses to do business with you, and it’s important to remember that your customers don’t owe you anything. © 2011 Charles Marshall. Charles Marshall is a nationally known humorous motivational speaker and author. Visit his Web site at www.charlesmarshall.net or contact him via e-mail at info@MPowerResources.net. One Response to Some Kidding Aside – Are You Trying to Go Out of Business? I’m not a mechanic. However, if I take something apart I can put it back together with new parts. My John Deere lawn tractor broke down. I’ll give you the shirt version. I ordered John Deere parts online. I received the correct carburetor but did not receive the spacer and was given the improper size gaskets (2). When I called customer service, the guy on the phone came close to calling me a liar. Like I have a secret Black Market business selling John Deere gaskets. So, when I offered to take photos if the gasket next to the intake manifold the CSR couldn’t give me his email address fast enough. A week after calling JD CS the placement package arrived. Guess what. Only ONE GASKET! Now I’m more than annoyed. I called back again. This guy was nicer. He even offered to ship next day. He said I would have it Monday (this is Friday). After I protested he “checked” to see if Saturday delivery was available. I got the other gasket Saturday. Got everything put back together and it still wont start! I drove the forty-eight miles to the John Deere dealer. The problem? I had installed the improper sized gaskets!! By now its been a little over two weeks since I started trying to get my mower fixed. I planted winter rye grass. I promise you I am not imbellishing when I tell you it was fifteen-eighteen inches high!! Knee high essentially. I’ve spent right at nine hours over two days having to cut it six times. I’m spent. I’ll never, ever, ever order from those online guys again! Never. Ever!